Before we get started, it’s important to note that I have absolutely NO affiliation with any bank, nor do I stand to receive anything from the banks listed in this article, or any other, for that matter. Plain and simple, I’m very pleased with my experience with this particular debit card [so far] and wish to share what I’ve found with like-minded travelers. When I started traveling overseas back in the 1990s, travelers carried around these crazy slips of paper called traveler’s checks. The idea behind traveler’s checks was being able to travel far and wide with enough money on you to cover expenses without carrying…well…all, that money on you. When funds began to run low, you’d visit a bank branch, go through the often tedious and drawn-out process of getting access to your own money in a foreign country, and leave with your wallet replenished. Traveler’s checks were neither convenient nor reliable (banks were often few and far between or closed at odd hours), but were the best thing going for the times. By the mid-90s ATM machines were well-established, but foreign withdrawals were not, making travelers checks the go to for long-term travelers. Over the next decade, all of that changed, of course. By the mid-2000s, debit-Visa and debit-MasterCard machines were available throughout most provincial capitals of the world, even in the least industrialized countries (though as many regular travelers to developing countries know, the presence of a machine and being able to successfully withdraw money from said machine are two very different things). In general, the propagation of Visa and MasterCard-compatible ATMs across the globe has made travelers’ lives easier and more secure. But the fees. Those bloody fees. Many banks tack on hefty transaction fees if not using their branded ATMs, and more fees to withdraw money overseas. If you happen to be banking with a bank that doesn’t have such fees, don’t worry—the ATM most certainly has you covered. Expect to pay between $2.00 and $10.00 per transaction overseas, and there’s nothing your bank can do about. Well…there is, but we’ll get to that. Some months we were paying upwards of US$100 a month in ATM fees, just to access our own money overseas! Thus began the hunt for a new debit card (i.e. new issuing bank), and what we found surprised us. 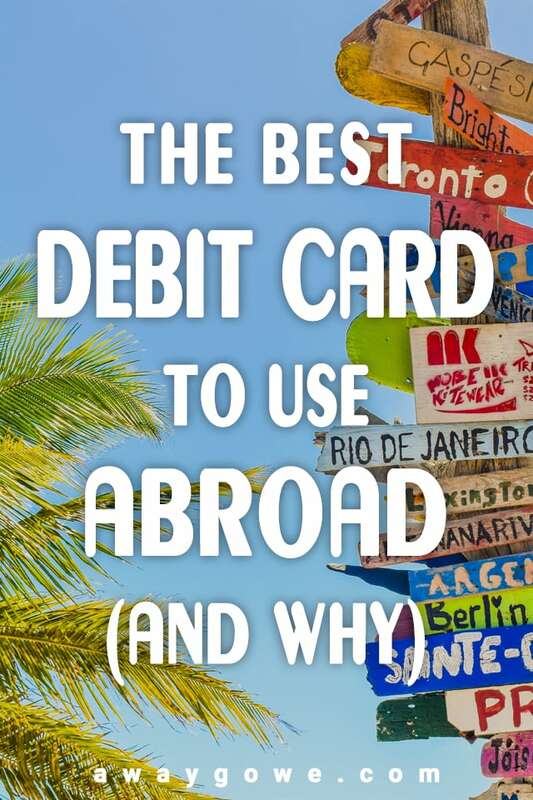 So, What is the Best Debit Card to Use Abroad? At the recommendation of my sister and brother-in-law, we ended up with Charles Schwab. That was three years ago and we haven’t looked back since. Schwab’s services are predominately online-based, so you won’t find branches on every corner like BofA. But one of the main perks of Schwab is that they reimburse 100% of your ATM fees—ANYWHERE IN THE WORLD. At first I thought, big deal, they don’t charge transaction fees on their end. But, no—they credit your account at the end of each month for ANY transaction fee charged ANYWHERE at ANY ATM. Three years on, and I’ve never not been reimbursed the full amount of my ATM transaction fees, meaning I can effortlessly withdraw funds just as easily from a Bank of America ATM in Portland, Oregon, or a Barclay’s ATM in rural Uganda and all of my fees are reimbursed at the end of the month. Truly 100% No ATM Transaction Fees, at Home or Abroad!!! I can’t even begin to emphasize how much of a biggie this is for us as travelers and expats. Like I said, there were some months overseas where we were racking up $100 in ATM fees alone—not pleasant for anybody’s situation, but particularly hard to swallow for long-term budget backpackers living and traveling 100% off of savings. That’s TWO-WEEKS accommodation in India! Or ONE HUNDRED half liter beers across Asia. Now, we don’t even worry about ATM fees. While Lori does get paid out a per diem in local currency every month that covers much of our monthly costs, it doesn’t cover everything. Medical care expenses, regional travel, and daycare expenses all end up being paid out from our U.S.-based checking account where her salary and my earnings are deposited, which is easily accessible from any Visa or MasterCard compatible ATM in town, at no additional cost to us. I’ve also been really happy with what I perceive as sensible security measures on the part of Schwab. It’s been a few years since I’ve had to submit a “travel note.” With the smart chip upgrade on all their debit cards, travel notes are largely obsolete, as Schwab is able to better track potentially fraudulent use without the need for a travel note. Obviously, no system is perfect and the bank can’t protect against fraud measures such as skimming devices at ATMs. But it’s nice to be able to roam freely without worrying about submitting travel notes and/or getting my card locked every other month due to fraud concerns while traveling. Every time I’ve ever had to contact customer service at Schwab, I’ve gotten through to a real person quicker than any other bank I’ve used, and on the whole I’ve found their reps to be not only friendly, but more knowledgeable. And, if they are not confident in the answer they’re giving you, they’ll quickly switch you to a specialist in a matter of seconds. We’ve been able to get ahold of reps at all hours in a matter of minutes, and some have even helped us over multiple hours, days, or even weeks troubleshoot a complicated issue we were having with Lori’s Belgian salary payment in Euro to our Schwab account. Turns out, it was an issue on the employer’s accounting side, but the Schwab reps were exceedingly patient and even contacted them directly to walk them through the process. Based on three years of experience using my Schwab debit card across a multitude of countries and circumstances, Charles Schwab’s debit card, in my view, is the best debit card to use abroad. With ZERO ATM fees worldwide, sensible, travel-friendly security measures, and their awesome 24-hour customer service, Schwab would be hard to beat for international travelers or expats.